Ok so it’s the first round of the UAAP and Ateneo may have come from even bigger margins before, but for its game against University of the East, Ateneo was playing with a smaller lineup against a team team that had two athletic African imports and an inspired All-Star guard. After the first quarter, I’m sure it seemed to many that Ateneo was going to get steamrolled this game. Everything went UE’s way. Charles Mammie was lording it over everybody. The UE press disrupted the Ateneo offense which led to many turnovers and easy baskets. Roi Sumang was playing well while Kiefer Ravena was 2/9 with 12 points. Luckily basketball is a tale of two halves. In sports, it’s not how you start but how you finish that counts. An Ateneo recruiter friend mentioned that at the start of the second half, Kiefer had his “Kobe-look” and that would mean problems for UE. 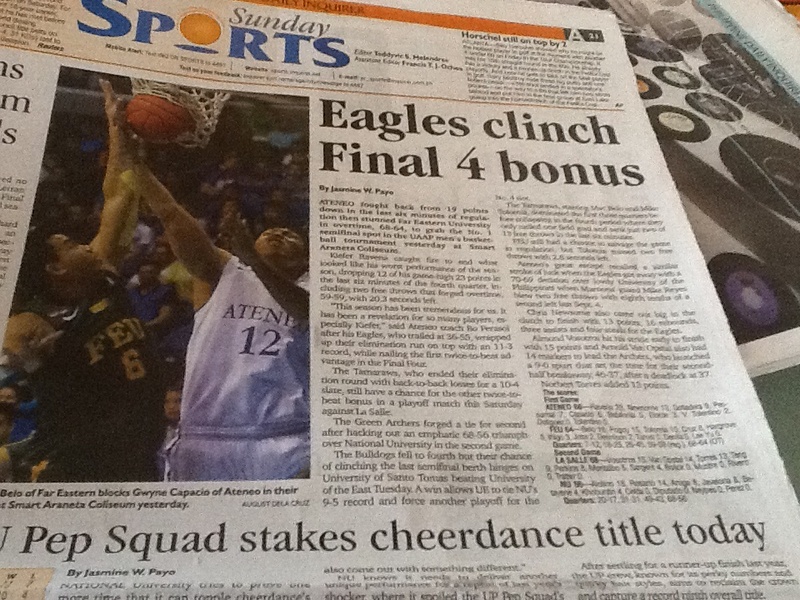 Whatever the Ateneo coaching staff told its players during the break worked big-time. Somehow UE couldn’t get the ball to Mammie down low. The UE press slowed down the Ateneo offense but didn’t result in turnovers anymore. The Ateneo offense started to click under the leadership of Kiefer. The second half became the Ravena-Sumang show leaving the whole arena in awe. With five minutes to go, Ateneo was behind by 12 and down by 6 with 2 minutes to go. 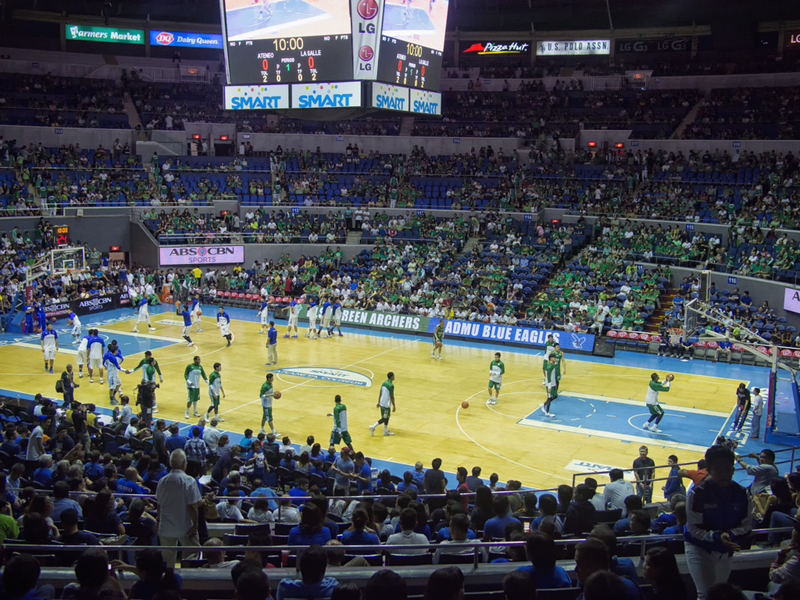 Then Ateneo made it’s run and tied the score at 80-all resulting in the first overtime game this UAAP season. In the extra period it was still the Ravena-Sumang show. Ateneo controlled most of the overtime period and won 93-91. Ravena had a career high 38 points while Sumang had 30. UE should be actually performing better than its 2-4 current standing. It’s just that they start strong but somehow in the second half they collapse. This happened to them in their tiff against La Salle. I regard them as a “hard-luck” team because they seem to lose when they should be winning! Somehow their opponents just end the game stronger than them. At the start of the season, I projected UE to be a Top 3 team behind DLSU and NU with Ateneo, FEU and UST fighting for the last Final Four spot. UE can still make the Final Four but they have to start winning fast! Assuming it takes 8 wins to make it there, they have to win 6 out of their last 8 games. Ateneo on the other hand is at an enviable 6-1 standing. Their only loss was to a tall and athletic NU team which defended Kiefer well the entire game. I have said before: wherever Kiefer goes, Ateneo will go. The Blue Eagles live and die with the Phenom. For two straight games now he played hero to win close games. Can he do it again in the second round? I hope so with the help of his supporting cast.